Recall from last week’s article, the overall situation of the commercial banks can be regarded as satisfactory despite the distortions in the foreign exchange market earlier in the year. It was also observed that the largest portion of banks’ deposits are from households, which averaged 82 per cent during 2007 to 2011, compared to an average 18 per cent share of deposits from businesses. The share of deposits from households declined nearly three percentage points from money deposited in the 2007 to 2011 period. Interest rates on savings accounts continued their decline too. It is therefore not surprising that households did other things with their money as against putting it into the banking system as the data suggested. While the share of deposits from households remains dominant as against the share of deposits from businesses, the share of loans to businesses is significantly larger than that to households. In the period 2007 to 2011, the average share of loans to businesses was 69 per cent and has grown to an average of 75 per cent for the period 2012 to 2016. It is clear that households generate most of the deposits through their savings accounts and businesses withdraw most of it in the form of loans. The principal service of the banks is to provide intermediation services. There are many persons and businesses with excess money. On the other side, there are many who have a deficit and need additional cash. Not everyone has friends with excess money whom they can ask for financial help. Those with excess money might be smart enough to know that they can charge the friend a small interest rate and earn something from parting temporarily with the cash. Not everyone has the time, energy or skill sets to make money lending a profitable venture. That is where the banks come in. The banks serve as a central repository of money from all those unknown with excess money who want to put their money in the banks. Those persons who have a deficit do not have to go from street to street asking people if they have excess cash to lend. They can go directly to the bank. For one set of customers, the banks are custodians of their funds and try to protect them. The other set of customers are the borrowers, the ones who want to use the excess funds. Very often one cannot tell the difference between the people who provide money to the bank and those who want to borrow it from the bank. This latter group often has the bigger beef with the bank. One source of the problem is the interest rate at which banks lend the money. From Table 4 below one can see the difference between the rates at which the banks lent money during the period 2007 to 2011 and the rate at which it borrowed money from depositors. The spread was between 11.50 to 12.01 per cent. The average gain by the banks was 11.74 per cent. A further analysis of the data shows that the lending rate of the banks fell five per cent per annum while the interest rate on savings offered to depositors fell about 37 per cent per annum. As a consequence, the spread rose nearly four per cent annually. For the period 2012 to 2016, there have been adjustments in the rate at which the key interest rates changed as well as could be seen from Table 5, (above right). The interest rate charged by commercial banks declined at the rate of six per cent per annum and ended with an average of 13.06. At the same time, the interest rate on deposits declined 25 per cent per annum and ended with an average of 1.36 per cent during the review period. The spread actually declined three per cent per annum as against the four per cent annual rate of increase that was evident in the prior period. Using the averages, the difference between the two time-periods is much larger than it appears at first glance. The lending rates of the banks declined 10 per cent while the interest rate on savings deposits declined 50 per cent. Though the spread declined three per cent annually, it hardly changed when measured by the change in average of the spread for the two periods. Banks would return a depositor’s money easier than it would lend it. It becomes a different story when depositors want to take out of the bank more than their own money. Banks have to be careful lest they find themselves unable to repay the money to their depositors. With a desire to limit their risk, the commercial banks often behave like fair weather friends. They will give you an umbrella when the sun is shining, that is when your business is bright and beautiful. But banks will take back their umbrella when it rains, that is when your business is not doing so well. They are guided by the level of risk which they are willing to take with depositors’ money. When customers begin to default, the fists of the banks become tighter. But there are other things that bother customers in their relationships with banks. Recently, there have been complaints about efficiency, service dependability and accountability. A number of cases have emerged where individuals are finding discrepancies in their accounts that banks cannot justify. Taking an entire half day off work to get a single minor transaction completed irritates many. In addition, going to one branch to be told of one internal problem and being sent to another branch to only find the information initially dispersed was incorrect is discouraging to many customers. Such a breakdown in the lines of communication costs customers valuable time. Also, having to wait and follow up for information that was promised to be sent in a timely manner is annoying to many customers. When customers look around for reasons for the apparent insensitivity, they often come up with the lack of competition. They think that they are being taken for granted and the lack of competition is causing many commercial banks to do as they please in a near oligopolistic market. The bank machines available at supermarkets and stores malfunction and create much inconvenience when attempting to complete payment with their bank card. Another reason is insufficient process and product innovation. For some customers, the lack of apps to conduct transactions from wherever they are has become frustrating. Today’s customers want convenience. Being able to transfer funds and pay bills from the comfort of their home can make a big difference in the relationship between banks and their customers. 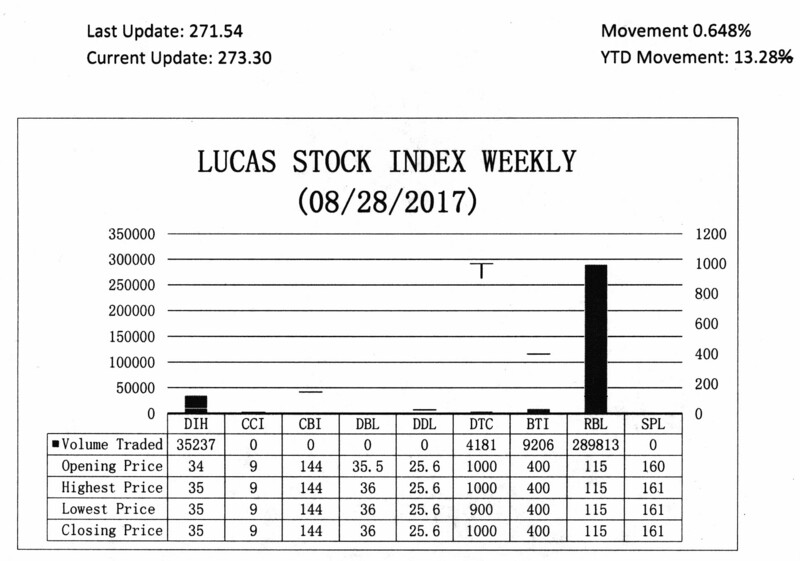 The Lucas Stock Index (LSI) rose by 0.65 per cent during the fourth period of trading in August 2017. 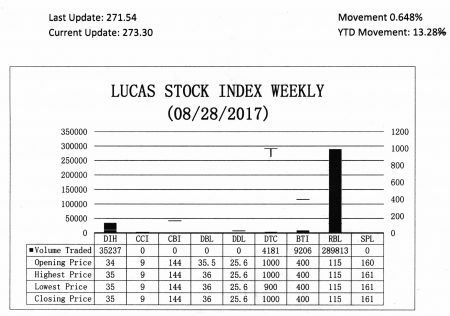 The stocks of four companies were traded with 338,437 shares changing hands. There was one Climber and no Tumblers. The stocks of Banks DIH (DIH) increased 2.94 per cent on the sale of 35,237 shares. 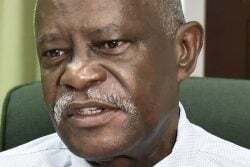 In the meanwhile, the stocks of Republic Bank Limited (RBL), the Guyana Bank for Trade and Industry Limited (BTI), and the Demerara Tobacco Company (DTC), remained unchanged on the sale of 289,813; 9,206 and 4,181 shares respectively.